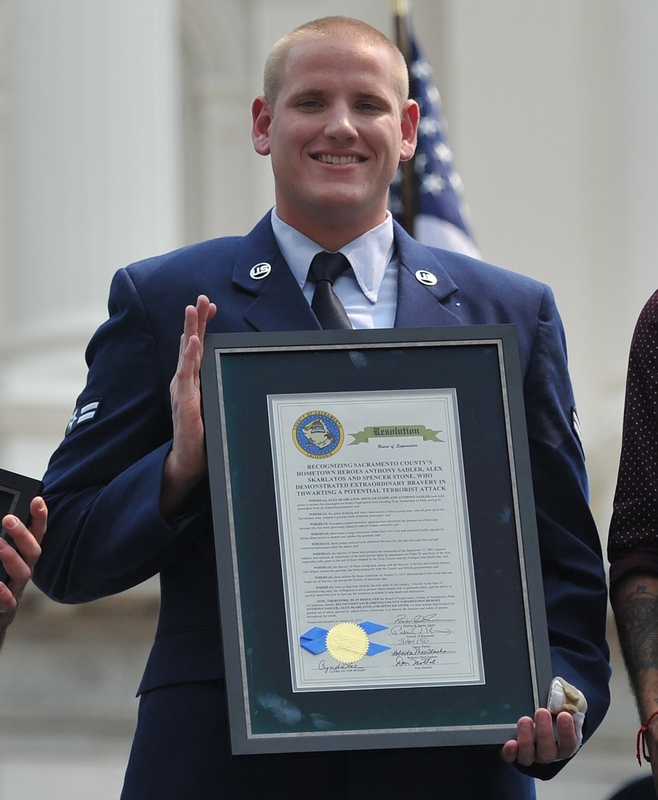 On Wednesday night, an incident occurred that no-one saw coming — Spencer Stone, an American hero who was awarded the Purple Heart for thwarting an apparent terror attack on a French train back in August, was stabbed in Sacramento. Though it's unclear who stabbed Stone, what we do know is that Stone was "stabbed repeatedly," according to CBS News, and is in stable condition, according to an Air Force statement. "We do not have any information as to the events preceding the incident," the Air Force admitted in the same statement. However, NBC News reports that, according to Sacramento Deputy Chief Ken Bernard, Stone had been stabbed after a clash between "two groups of folks who were enjoying the nightlife." "It is believed that the victim was out with a group of friends when a physical altercation led to the victim being stabbed multiple times in his upper body," Sacramento police said in a statement, adding that a man and a woman had been questioned. Back in August, Stone was traveling with two friends, Anthony Sadler and Aleksander Skarlatos, when an armed man opened fire on the Paris-bound train carriage in an apparent terror attack. Stone tackled the assailant, and was stabbed with a box cutter in the process. He then came to the aid of French-American professor Mark Moogalian, who had been shot by the gunman, and performed basic first aid and counseled Moogalian. "I remember it very well because he was talking to me trying to keep me from losing consciousness, and said after this is over we'll go get a beer," Moogalian said later to the TODAY show. Afterwards, Stone underwent surgery to repair part of his hand that was damaged in the incident.